You can modify this recipe to make more or less. This year, since I'm all about non-toxic ingredients, I've edited it a tad, but if you can't find organic chocolate or sugar to your liking then do what you can. The process is fairly easy. Step 1. 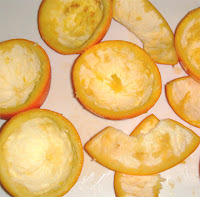 Scrape the inside of the orange peels to remove the residual orange from the pith. If the pith is really thick, scrape it out with a vegetable peeler or a knife. Step 2. 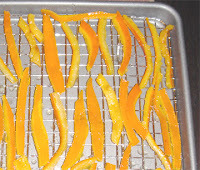 Cut the peels into strips about 1/4" in width, removing the parts where the stem and the orange end are and any parts that don't look good. Step 3. Put the strips into a medium sauce pan and cover with cold water. Bring the water to a boil to blanch the peels. This helps remove the bitterness of the pith. Repeat the blanching process one more time (if you removed a lot of the pith) or two more times if you left a lot of the pith on (like I did). Step 4. 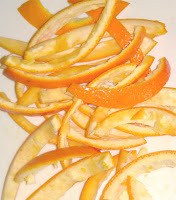 Drain the peels and rinse with cold water. In the same saucepan add the water and sugar and bring to a boil. It will start to boil somewhere around 210 degrees F.
Step 5. 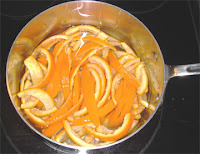 Once the sugar syrup is boiling, add the peels and bring the temperature back up to boiling. Simmer the peels on medium low until they become translucent. Depending on how much pith is on the peel this will take anywhere from 1/2 an hour to 1 hour and 15 minutes (this is how long it took mine). Step 6. When the peels are looking translucent, use a pair of tongs and remove them from the pot, placing them on a rack set over a cookie sheet to catch the drips. If you want you can roll the freshly removed strips in additional sugar but I found this to be a huge mess. Step 7. Leave the peels out to dry. If you want to speed things up you can put the whole cookie tray/rack combo in the oven at 250 degrees F for an hour or two (just skip the non-stick!). Step 8. If you want to dip the strips in chocolate, melt the chocolate over a double boiler and dip, laying the strips down on parchment paper to dry. Would a pinch of salt in the boiling water help even more to remove the bitterness from the remaining pith? Thank you for posting this, my stepdad LOVES these. You make it sound so easy! Any idea how long they keep? What a great way to use something that would have otherwise gone in the compost. Ive wanted to try these for ages. Youve inspired me to make some this weekend. Thanks. oh, I dearly love choc-covered candied orange peels. will have to try them, though I'd pretty much given up candy making as too much durned trouble! Any idea how long these keep? Have you shipped them?